Best Friend Dog Park of Huntington provides a safe, fun place for dogs to socialize and exercise. This is an off-leash only dog park. Dogs are to be unleashed inside the entrance safety zone before entering the park." A great off-leash only dog park in HB that has separate fenced in areas for both small & large dogs. Huntington Dog Beach In Ca. Does it get any better than this(?) Wow, not just a place to kick off your sandals, but a great beach atmosphere that allows your dogs the fun of frolick in the sand and sea. "Huntington Dog Beach is a non-profit corporation run with the efforts of both our staff, employees and volunteers. We depend upon your donations to keep Dog Beach open." Established in 1994, the Costa Mesa Bark Park is a totally fenced in, approximately 2 acre piece of land designed by the City of Costa Mesa as a permitted area where the public can take their dogs & allow them to run & play off-leash. It is the only area of Costa Mesa City where dogs are not required by ordinance to be on a leash. Very popular. Arbor Dog Park In Seal Beach, Ca. Arbor Dog Park is a 2.5 acre grass park with several large shaded trees. A great place to meet other dogs for off-leash romps and antics. Break out the soccer ball or tennis ball for some fetch, dad! This pet park features drinking areas for both humans and canines alike as well as trash cans. Th park is brand spanking new in late 2004. Beautiful. Great news. The brand new off-leash Orange Dog Park located in the southwest corner of Yorba Park is now completed. The Grand Opening was June 5th, 2005. This website is actually the Orange Dog Park Association which spearheaded the building, funding, design and launch of this multi-year project. So grab your dogs & head there. Donations welcome. Dog Beach Zone: 3 Off-Leash Acres in Long Beach, Ca. 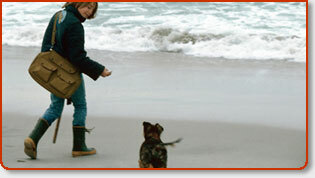 An excellent website here that gives you ALL the details about Los Angeles County�s only off-leash dog beach around. Doggie fountain located at the parking lot. Important to understand 2 things: 1. only 1 dog per human is allowed & 2. the beach is open to your canine pals from 8 a.m.to 6 p.m. daily. Your dogs will LOVE this dog beach in Long Beach! Lots going on with Friends of the Redondo Beach Dog Park. They make it possible through donations & diligence to keep the park operating & overseen. Donations accepted as well as volunteers. The website gives great advice about dog ettiquete while at the park with your hounds. Read the page under "Rules" link which is good advice for any dog park. "CalDOG is a non-profit organization that promotes & lobbies for recreational access to public lands for folks with dogs in the State of California." Awesome group of advocates that provide resources & direct assistance in getting results when you desire a new dog park established in your area. Utilize their public relations & proven experience. A few good pictures of this smaller size dog park which ia approximately 1 acre in size of romp room. There are only 25 parking spaces, but do not use the parking sports at the actual fire station. The dog park is fenced, it has a water hose for dogs and restrooms for dog owners to use. The ground is made of a wood chip. These are actually people parks, but the website states clearly that 3 parks can be utilized for on leash dog walking as well. I have never been to any of these parks and the website has little additional info. Apparently these are the only 3 parks in all of San Clemente that allow dogs. But alas, where you finding hiking trails, it is allowed. What�s unique about this dog park in the Laguna Woods/Laguna Hills area is that small dogs have run of the park each day from 8 a.m to 1 p.m. Ha! How you like that big dogs. :) OK, I�m done now. Actually, from 1 p.m. and on, both small and large dogs can socialize and play together. This is a pretty unique policy that I have not seen elsewhere. Chino Hills State Park is right on the border of OC, so I think you may be interested in this website. Understand that our dogs are not allowed in the backcountry & only where I have listed. Be aware, irrespective where you are in the park, the dogs are always required to be on leash. That being what it is, it�s a beautiful park of monstrous size. Wow, what a great compilation of pet friendly dog parks we can all take Fifi and Fido to. The website also enumerates dog parks in Orange, San Clemente, San Juan Capistrano and even a few dog parks in Santa Ana. Nice. Laguna Canyon Dog Park is here, O�Neil Regional Park, Lantern Bay Park and William Mason Regional Park too, which accomodates dogs. THE website to end all websites when it comes to local hiking in Socal that (MAY) allow dogs to hike with you. I say "may" because it is your responsiblity to read through the vast information provided at this site for any of the hiking areas listed you may want to hike with your dogs at. A few allow it, and many don�t. Good luck with your search. A real good laundry list of parks that allow dogs, both on leash & off leash are listed. Parks include: Carbon Canyon Regional Park, Clark Regional Park, Craig Regional Park, Dana Point Harbor, and Featherly Regional Park in Anaheim, Ca. Also, Heritage Hill Historical Park allows dogs in El Toro as well as Irvine Regional Park in Orange County. I really wanted to get this LA website in. This is a great organization that gets together very regularly and explores the Los Angeles foothills and mountains with their dogs in toe. Or the other way around if you have a speed puppy. :) This is a very casual dog club with free membership. The only cavaet is that dogs be leashed & controlled. Established in 1994, the Off-Leash Claremont, LA County Dog Park hours are from 7:00 AM until 9:00 PM. This pup park features shaded trees, drinking areas for dogs and plenty of benches to relax and watch your dogs be perform their silliness. Donations for park improvements are appreciated. This site is actually a group of folks called Friends Of The Culver City Dog Park. They�ve actively worked with the city for a couple years now to build an off-leash dog park in Culver City called the "Bone Yard.". I believe they have completed the brush clearing, etc. stage in the area required and now need further building funds. Please donate. It�s just across the street from the San Pedro Harbor and is open to the public from dawn to dusk. Note: chairs are not allowed, but wheelchairs of course are. The grounds are mostly wood chips and in the past a small amount of grass. There is no smoking allowed in the San Pedro off leash dog park. Leave the cigs, bring your dog for a big smile. Friends Of Barrington Dog Park (FOBDP) is the volunteer maintenance, fundraising & event-planning team for BARRINGTON DOG PARK. They were established to look over and improve this LA dog park, which is located in the Barrington Park Recreation Center. This is a real fun, active dog park with plenty of people to rub elbows with & dog tails to chase. I am not certain this is the official website for the LA Silverlake Dog Park. I have not been to this one and the website offers little updated info...so you are on your own. Grab the pups and goooo check it out. Enjoy. This is an absolute must hiking trail. Read where dogs are allowed. "There is the western trail which, from the southern approach at Vista, starts just inside the secondary gates (where dogs can be let off their leashes) & takes the hiker along the spine of the ridge to the 2nd highest point in the canyon with incredible views to the West & South. This dog park is open from 5am to 10:30pm in Venice. Keep in mind that only dogs are allowed at the park facility. Not really much in the way of an informative website here and I have never been to this park before. Let me know what your dogs think. This is a relatively newer dog park which opened in 1999. This 5 acre good size park is perfect for socializing with other dogs. Check back with this website if you like meeting and greeting other dog park activists as they often plan meetings of sorts. Animal control officers visit this park (& others) so make certain you have your dog tags on. If you have never been to the Camarillo Off Leash Dog Park and need directions, use the phone # supplied. The Dog Park is inside of Camarillo Grove Park. Just so there is no confusion, although you are required to pay for entrance at the park, if using the dog park only then there is no fee. Plenty of photos of dogs at the park with their owners. Thousand Oaks Dog Park In Southern Ca. "The Conejo Recreation & Park District has a dog park at Avenida de las Flores (northwest quadrant of Conejo Creek). The enclosed dog park area is 3.75 acres, approximately 1.5 acres for the large dog area & 1.25 acres for the small dog area. There are three double-gated entries - 2 for the large dog area & 1 for the small dog area. Go fetch dog! Directions are offered on the site through a visual map. Open sunrise to sunset except on fridays� there is early morning maintenance. Fridays the park opens at 11:00 a.m. Do not park on Whiteoak or Victory streets. Plenty of fun dog photos on the site posted over the years. San Diego Dog Beach In Ca. "Since 1972, San Diego�s Dog Beach has been a legal off-leash paradise for dogs. It offers 38 acres of sand where the San Diego River meets the Pacific Ocean. Please pick up after your pet." This is the only area of beach in San Diego that I know you are your 4 legged best friends can "dig in." Opened in the year of 2002, Wildwood Dog Park in San Bernardino offers you and your pups a play area that is roughly three acres in size. The dog designated area is subdivided into two play areas - one for small dogs and the other for medium to large. They switch them back & forth so make note of it. You may bring up to two of your dogs at a time. We have some of the most beautiful mountains in all of Southern Ca. to take your dogs hiking with - the Santa Monica Mountians in the Encino area! Go get the leashes...NOW! ;) The park is accessible from both the San Fernando Valley and West Los Angeles. The Westridge fire road provides trail access for hikers, etc. along the north-south ridgeline. Pet friendly dog parks, where the signs all read the same glorious words: Pets Welcome! Hurray! OK, it�s the �dog days� of summer and your wondering where to take your favorite fury non-human friend to avoid sweating on your new carpet at home any further. No problem. How about the great outdoors for your dogs? Plenty of fun filled days to be had playing fetch with Rover on the pet friendly beaches and dog parks of Orange County and Los Angeles. Hey, the Northern California dog parks and dog beaches are equally beautiful too. My dogs aren�t fussy, if it�s a dog park or pet friendly beach, they�re there man. I�ve listed some of our favorite dog parks and even hiking trails that are more than just casually accepting of our dogs, but actually throw out the ole welcome matt and leave milk bones too. A little dog humor.